I last visited New York two years ago and was able to walk (part of) the High Line myself for the first time; next week I’ll be back – which is why I’ve been thinking about it recently – and this trip I’ll get to walk further. 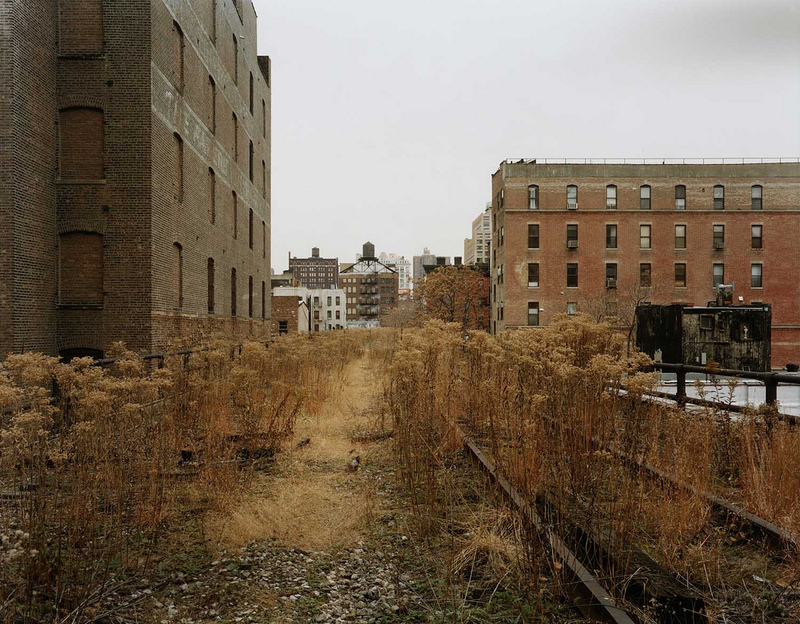 My excitement at the prospect of visiting the High Line two years ago came from its familiarity from Joel Sternfeld’s extraordinary photographs made in 2000-1 and published as Walking the High Line. Like many of Sternfeld’s photographs, these document what the artist refers to as a degraded landscape. There are clear signs in the surrounding buildings that the tracks are not the only decaying space here. But there are signs of unexpected life too. The trains that once used the line carried with them seeds from plants native to different parts of the United States, once the trains stopped rolling the seeds that had lain dormant prang to life and wild flowers not usually seen in New York flourished. Sternfelds photographs, though sometimes bleak, ultimately offer a picture of hope. The seasons change, plants flower and die back down, one resident puts his Christmas tree on the tracks: life goes on. 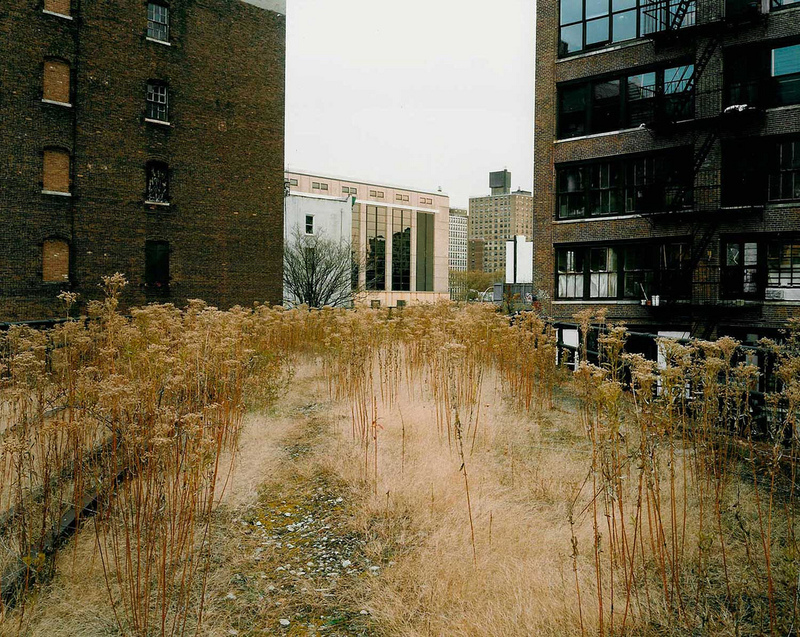 The High Line I will walk in a few days looks very different now. There are still plants but fewer of them; they no longer grow freely across the tracks. But as a park the High Line is extraordinary. The views of the city are unique – there are familiar buildings of course and typically New York sights such as rooftop water towers but the chance to see them from this viewpoint isn’t matched elsewhere – and the park can be used to make a journey through the west side of lower Manhattan. Sternfeld’s pictures, a remarkable series in their own right, helped secure the future of the tracks and make that future one that everyone could share. 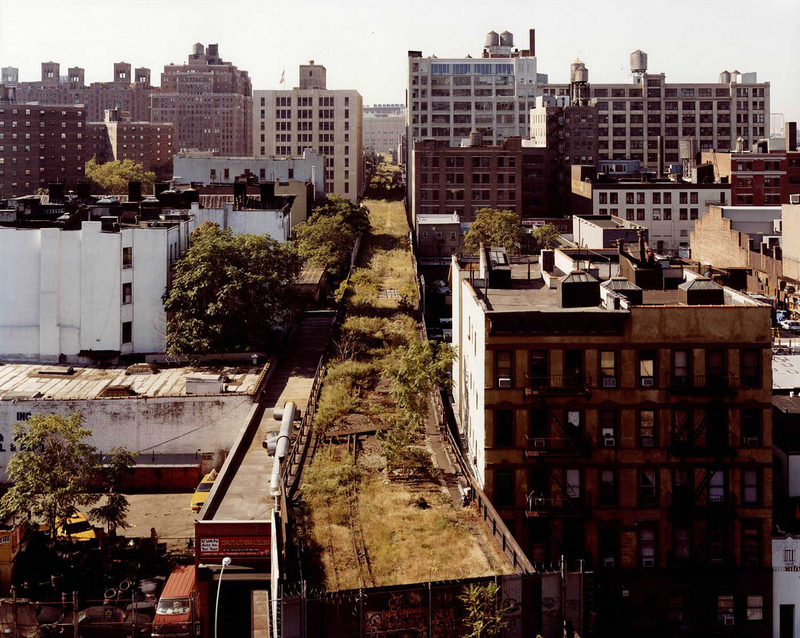 This entry was posted in Photography and tagged art, degraded landscape, elevated railway, High Line, Joel Sternfeld, Manhattan, New York, photography, walking the high line by Ann Jones. Bookmark the permalink.